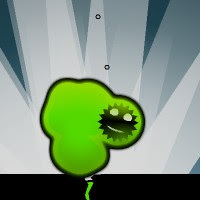 Oozing Forever, the latest physics-based platforming action game by developer PixelAnte (Towering Forever, Hunted Forever), puts you in the shoes of Mr. Ooze, a strange, spiky little creature surrounded in a cloud of green goop. You’ll need to help the little protagonist escape from the wreckage of a secret science facility, where something has gone terribly wrong. (The slightly foul-mouthed) Mr. Ooze is controlled solely via the mouse. He’ll follow your cursor, which he’s sort of attached to by some rubber-bandy physics. Left-clicking will make him to jump. It sounds simple enough until you consider that the ooze surrounding the main character is integral to his propulsion power. More of the green glop can be collected by rolling over pockets of it that emanate from cracks in the ground. The more sludge that surrounds Mr. Ooze, the higher he’ll jump, and the more damage he’ll do when colliding with enemies. Enemies will slowly destroy Mr. Ooze’s protective layer of toxic waste, and intense light (and the beams of security droids) will slowly burn it away. Your success will largely depend upon your ability to master the squishy controls. Momentum will be your greatest friend, but may also be your worst enemy. The game is of decent length, and includes 16 different levels to complete. You may occasionally run into some performance issues on the default graphical settings, but you can adjust these to improve performance from the options menu. At the end of the day, it reminds me of a mash-up of the games Hunted Forever and Gen. While it may not be quite as excellent as either of those titles, Oozing Forever is still a very fun game that’s worth some of your time.